Railpictures.ca - Michael Da Costa Photo: Who’s Railway Is This?! The competition has showed up to Mac Yard leading CN 394, the incoming crew now heads to the shops ducking under the hump while an SD40 hump set awaits it’s next assignment. | Railpictures.ca – Canadian Railway Photography – photographie ferroviaire Canadienne. Caption: Who's Railway Is This?! The competition has showed up to Mac Yard leading CN 394, the incoming crew now heads to the shops ducking under the hump while an SD40 hump set awaits it's next assignment. 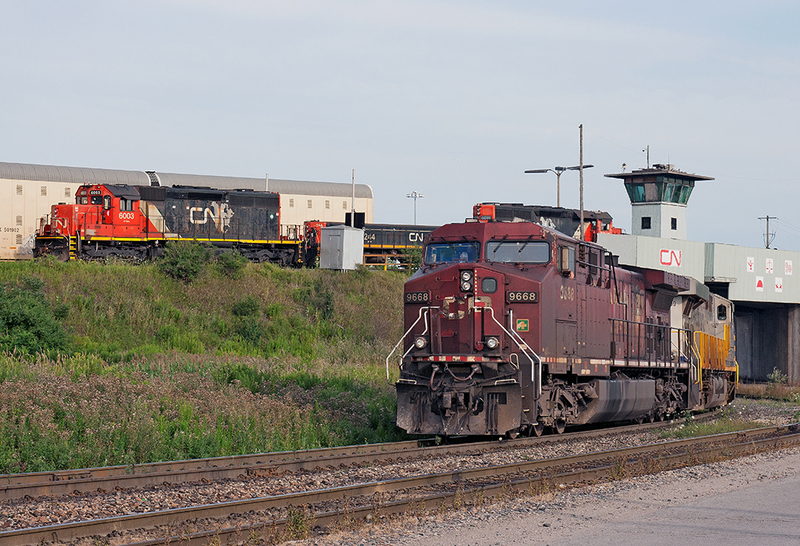 Caught that CP on 383 last Saturday paired up with CREX 1509 (which I take is behind the CP?). Is the CP unit paying back horse hours to CN ? Great shot Mike! I see CP sent them one of the most run down units, LOL. I sure miss seeing those SD40U’s out on the road. I’ve seen a few with CP units on CN trains lately. Are they leasors?